Notes: Bel Royal Halt located between Beaumont and Bel Royal and was one of four new halts opened in May 1923 with the introduction of steam railmotors as part of a programme to attract more passengers to the line after a dramatic fall in passenger numbers following the introduction of new bus services. There are no known pictures of Bel Royal Halt but it is assumed to be fairly insubstantial and probably built of timber, it was on the up side of the line. Despite some minor issues that could have delayed construction there was steady progress, and work was almost finished by September 1870; the first trial run along the line was made on 28th September. This went without mishap, and 300 invited guests rode on the train the following day. Further trials followed, and the line was approved for public use by an engineer appointed by the States on 17th October. There was a ceremonial opening followed by a banquet at Moirmont Manor, the contractor’s residence. 4000 single journeys were made on the opening day, with trains stopping at the three intermediate stations, First Tower, Millbrook and Beaumont. 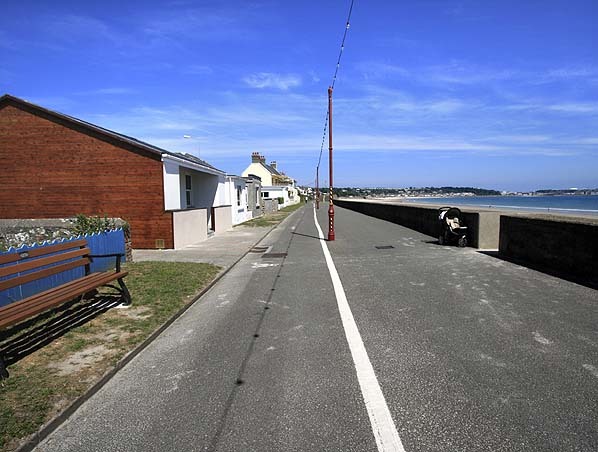 used because of the extremely sharp curves and steep gradients between St Aubin and Pont Marquet. The plan was to fit the standard gauge Jersey Railway track with a third rail to allow through running to St Helier. The site of Beaumont Halt looking towards St. Helier in June 2010. Beaumont Halt was very close to Beaumont which was on the far side of the white building in the middle distance.